Beautifully decorated unit in quiet location with very nice garden views and a peek of the ocean. 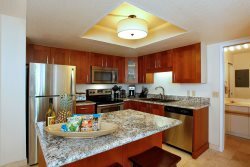 The Maui Kamaole is a luxury low-density complex, Tripadvisor rated 4.5 stars. 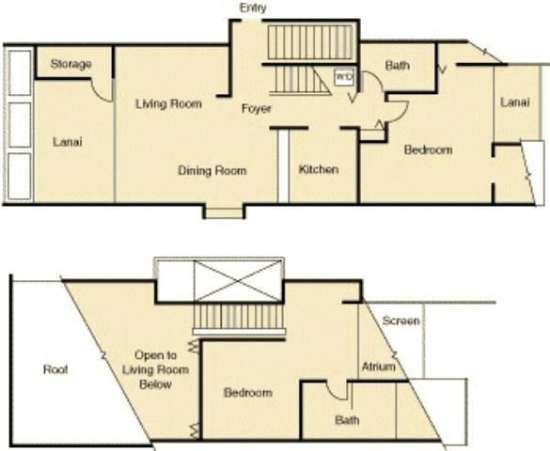 Spacious 2-story unit with designer furnishings and flatscreen TVs in each room plus Nintendo Wii for family fun. Air-conditioned with 3 separate lanais (patios), one off the living room, and one off of each bedroom. The upstairs loft master suite has a private bathroom with walk in shower. It is furnished with a pillowtop queen bed and large flatscreen TV. The second bedroom is modern also has a queen bed, private lanai, and large flatscreen TV. Maui Kamaole has 2 large pool areas, including the tropical pool with sand bottom spa/hottub near the E202 unit. Sandy swimming beach, Kamaole III, is across the street and can be accessed by walking through a meandering paved path through the beautifully landscaped grounds. This unit includes high thread count linens, Egyptian cotton bath towels, large beach towels, lightweight beach chairs, cooler, boogie boards, tennis rackets, family games, DVDs, Nintendo Wii, free high speed internet, and free local and US/Canada long distance calls. Also lots of baby gear like baby gate, PacknPlay portacribs, bed rails, umbrella strollers, high chair, booster chair, and baby carrier. *Even if your dates are available on our online calendar, we are unable to accept reservations that create unbookable gaps between bookings, so please check with us BEFORE booking online to make sure that your selected dates are acceptable. Longer minimum stays may be required depending on the existing opening. Late checkouts cannot be guaranteed in advance- if you have a late departing flight, we recommend you book an extra night to allow your family to fully enjoy your last day on Maui, then return to the unit to shower and prepare for the trip back home. This unit is often booked with back-to-back departure/arrivals, making the possibility of late checkouts after the time of booking rare. If you have a late departing flight but choose not to book the extra night in advance, please check with us after your arrival to Maui regarding the availability of one of the late checkout options below. OPTIONAL TRAVEL INSURANCE 6.95% of total: You are a valued guest and we want to do everything possible to make your trip enjoyable and worry free. Because the unforeseen and unexpected can occur before you leave or when you are away from home, we recommend and offer CSA's Guest Cancellation Insurance Plan. For specific detailed travel insurance coverage information, please contact CSA Travel Insurance directly at (866) 999-4018. Be sure to check VRBO.com for additional Maui properties.